NOTE: THESE ARE REDRAFT ROOKIE RANKINGS! Outside of Dion Jordan and Ezekiel Ansah, there aren't many prospects who stand out as potential long-term DL2+ fantasy options. This is in large part due to the value of several linemen falling post-draft due to role/scheme changes (e.g. Carradine, Mingo, Werner). Those in DT-required leagues should see an increase in viable starters at this position as this year's draft class was fairly rich with defensive tackle talent. Although there isn't a sure-fire elite LB1 prospect this year as there was in 2012 with Luke Kuechly, there are a slew of linebackers who could significantly contribute to teams this season. At the onset of the offseason, it looked as though Arthur Brown had the best chance at top 25 numbers, however hernia surgery has stunted his development for the time being and he's not likely to open as the season as a starter as originally expected. That leaves Kiko Alonso as the fantasy frontrunner at the rookie LB position to begin the year followed by Alec Ogletree in St. Louis. After that, there are several players who fall into the LB4 tier including Manti Te'o, Sio Moore, and Kevin Minter. There are two potential studs in the outside linebacker rookie group in Barkevious Mingo (now dealing with a serious injury) and Jarvis Jones, but outside of that small group, most will go undrafted outside of deep, big-play leagues. 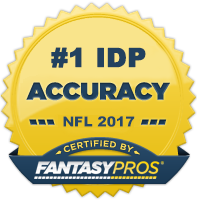 A perfect storm hit this year to create the strongest IDP safety rookie class in recent memory. Nearly every top-notch prospect went to a team with a strong immediate safety need. Kenny Vaccaro, Jonathan Cyprien, and Matt Elam all have elite DB1 potential in the long-term. And a handful of other safeties have at least DB2- future value. The cornerback position is quite deep as well this season. However, it's more difficult to flesh out their fantasy value at this time as so much is dependent on hard to predict variables. Your best bets as of right now are Johnthan Banks and Xavier Rhodes. Hopefully, these rankings will serve as a decent guideline as you attempt to navigate through the treacherous waters of this year's rookie drafts. Good luck to all!